Most people aren’t aware that the muscle fibers in their body aren’t all the same, but are very different from one another in that they are evolved to work in very different ways. Commonly they are separated into two groups – aptly named Type 1 fibers and Type 2 fibers. Let me explain to you a little about each. These are red fibers, and are sometimes known as oxidative fibers due to the fact they produce ATP (muscle energy) through intake of oxygen. Type 1 fibers are slow twitch fibers, which are built for slow but enduring movement because they are able to refuel by taking in oxygen when a person draws breath. These muscle fibers have high concentrations of mitochondria and myoglobin, and although they are smaller than the fast-twitch fibers, are surrounded by more capillaries. This combination supports their capacity for aerobic metabolism and fatigue resistance, particularly important for prolonged submaximal exercise activities. Type I fibers produce less force, are slower to produce maximal tension (lower myosin ATPase activity) compared to type II fibers, but they are able to maintain longer-term contractions, key for stabilization and postural control. 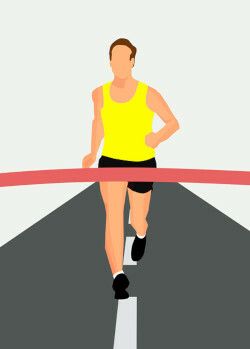 A person running a marathon, for instance, will be using Type 1 fibers. Type 1 fibers can be targeted with endurance training such as sets of lower weights with higher repetitions. Type 2 muscle fibers are the fast-twitch type are further divided into type 2a and type 2b. Typically, these have lower concentrations of mitochondria, myoglobin, and capillaries compared to our slow-twitch fibers and are quicker to fatigue. 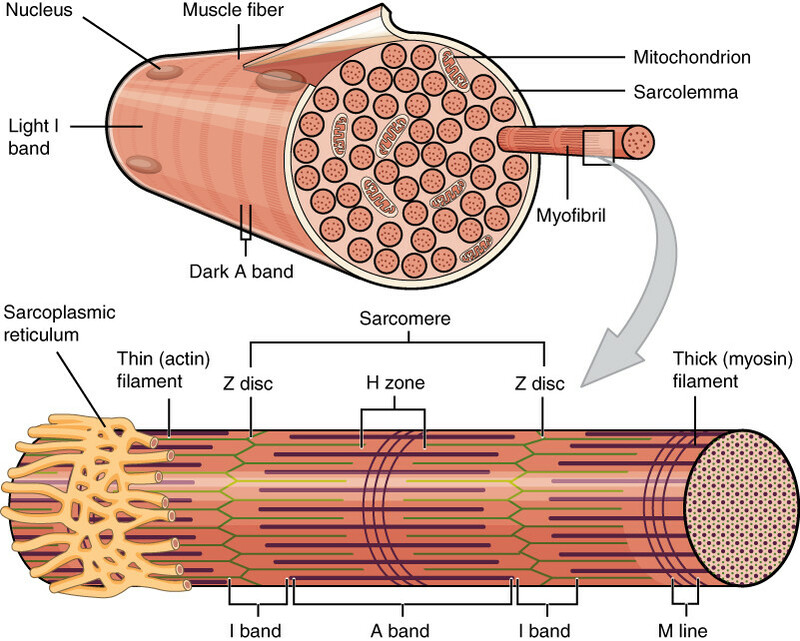 Type 2 muscle fibers are larger in size when compared to Type 1 muscle fibers and thus are able to produce greater and quicker power, although for a shorter period of time. This is an important consideration for power activities. Let’s go over the sub-groups of Type 2 fibers: Type 2a and Type 2b and discuss their role and differences. Type 2a fibers are what you might call the middle ground between Type 1 and Type 2b fibers (which is a hint to what they are). They are red fibers, and can also generate ATP from a person breathing oxygen. These fibers are able to ‘burn energy’ at a higher more explosive rate, and while this makes these muscles more explosive, it also makes them quicker to fatigue than Type 1 fibers. Someone running an 800 – 12000 meter race would for instance be using Type 2a fibers. Type 2b fibers are the complete antithesis of Type 1 fibers. They are white fibers, and hold very little capacity for endurance. 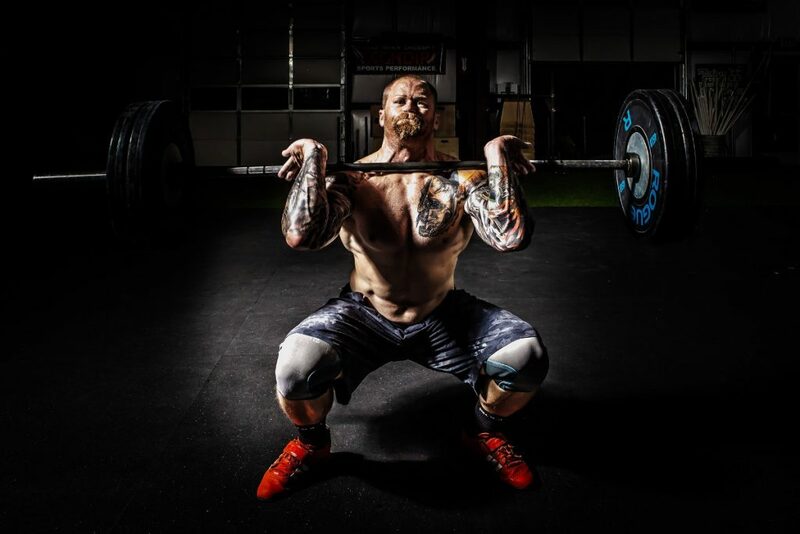 They are the most explosive muscle fibers in the body, and are used for events such as sprinting, long jump, high jump, shot put, hammer throwing, power lifting, and Olympic weight lifting… basically any event that requires a massive one-off or very unsustainable effort. The force generated is huge, and as such, the energy burned and muscle fibers fatigued quickly. Tapering during training program may also improve the strength of Type 2 a fibers without decrease in Type 1 performance. If you are a non athlete type then you may typically have close to 50/50 balance of Type 1 and Type 2 muscle fibers. For an Olympic sprinter there is a higher ratio of fast twitch (Type 2) fiber whereas for an endurance athlete will have a muscle composition favoring higher ratio of Type 2 fiber. Age is also a factor for determining ratio of Type 1 vs Type 2 muscle fiber. As one ages there is loss in lean muscle mass which results in decline if fast twitch (Type 2) fibers. This can lead to various age related metabolic dysfunctions. Maintaining a regular regimen of resistance training will slow down the loss off muscle mass effectively delaying the impact of aging on your body. Resistance training will add in increasing the size of both Type 1 and Type muscle fibers. The muscles of the body therefore are evolved to allow the maximum recruitment of the specific types of fibers to match the effort needed. That’s why training with weights in the manner needed to target the specific types of fibers will only work to strengthen and build the muscle types being targeted. For instance, hitting Type 2b fibers will do nothing for Type 1 endurance fibers, and vice versa.